Mobile device usage is said to exceed desktop/laptop usage in the near future. The mobile web is expected to grow exponentially as a result. 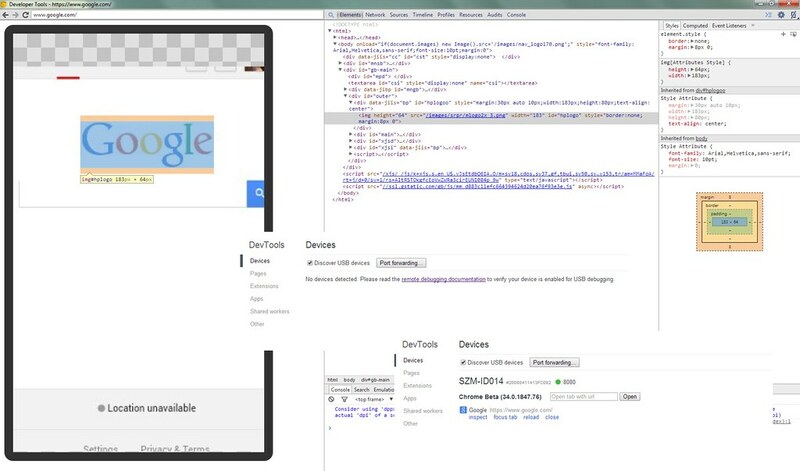 This post covers setting up the mobile developer tools included in Google Chrome to debug mobile web pages running on Android. Being able to debug your mobile web pages on an actual device is the best way to see how your pages will look and behave. Google provides excellent facilities for this. To do this you’ll need a desktop or laptop, an Android device and a USB cable to connect them together. Enabling developer mode on your Android device differs from build to build. The most common way is to go to Settings->About(device or tablet) and scroll down to the Build Number. Then click on it seven times. You should see a popup after the first few clicks indicating how many times you have to continue to enable developer mode. If that does not work consult your Android documentation. Now plug the Android device into your development system with the USB cable. Back on your development system, on the chrome://inspect page make sure the Discover USB Devices box is checked and wait for your device to show up in the list below. If you followed the outline above you should see your Android device listed along with any open tabs that may be open in Google Chrome Beta on the Android. From your development desktop you now have complete control over Google Chrome Beta on on your Android. You can open new tabs, reload a tab, close a tab, and inspect the document opened in a tab with Chrome developer tools. Once you start inspecting pages you can screencast what is displayed on the Android by hitting the mobile icon on the inspector toolbar. Now, you can inspect elements graphically on the screencast screen. In order to set up debugging your mobile pages from a local server on your Android device you must enable port forwarding inside of Canary on your development box. Set up your local server to use port 8080 as default is the easiest way as Chrome Canary has that set by default. If you’re entering a new port forwarding entry you cannot use port 80 or 443 – Chrome Canary will not allow you to set up port forwarding on them.